As a person ages, it’s normal to develop bags, wrinkles and lines around the eyes. Unfortunately, since the eyes are so noticeable, it’s hard to hide these flaws. Eyelid surgery, also known as blepharoplasty, corrects the appearance of dark circles or bags, deep wrinkles and other signs of aging around the eyes, making a person look much more rested and alert. Eyelid surgery may be combined with another facial surgery, such as facelift or rhinoplasty, for a more comprehensive transformation. Eyelid surgery can treat the upper and/or lower eyelids. During upper eyelid surgery, Dr. Fuentes makes a small incision in the natural crease of the upper lid. Through the incision, he tightens the underlying tissue and muscles, and removes excess skin. He gently pulls the skin taut and stitches the incisions together. During lower eyelid surgery, he makes an incision in the lower lash line and removes excess tissue to smooth the puffy under-eye bags. In some cases the incision can be made on the inside of the eyelid. This also reduces dark circles under the eyes. 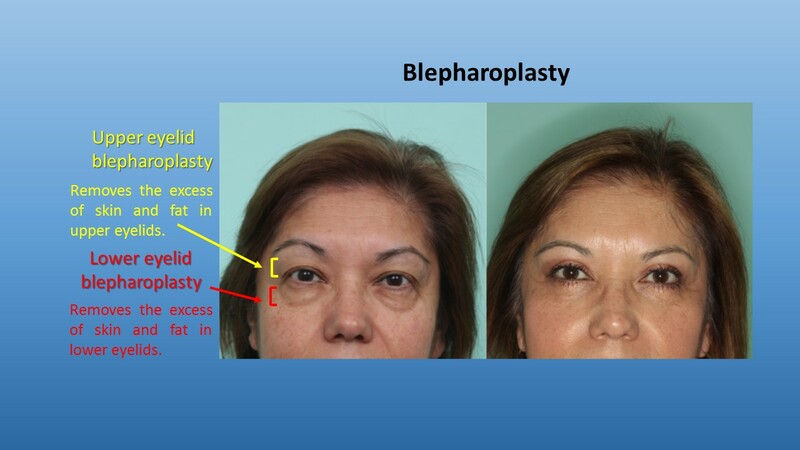 Blepharoplasty takes approximately one to three hours, depending on the extent of the procedure. If coupled with another cosmetic surgery, it could take longer. Post-operative eyelid surgery patients should get plenty of rest after their procedure. They may experience mild discomfort after surgery, but this can be soothed with pain medication. A full recovery from eyelid surgery may take several weeks. Any unusual side effects should be reported to Mexico eyelid surgery provider Dr. Fuentes so he can check for potential complications. He will provide more comprehensive recovery instructions prior to the surgery. To learn more about the benefits of eyelid surgery in Mexico, please email our office or call (619) 202-4443 to set up a surgical consultation with Dr. Juan Carlos Fuentes, the board-certified plastic surgeon Tijuana residents trust. Dr. Juan Fuentes is a well-trained and experienced cosmetic surgeon, providing for the aesthetic needs of patients throughout Mexico. As a leading facial plastic surgeon, he has helped countless rhinoplasty, ear surgery and face lift Tijuana patients achieve the look they desire. He is also skilled at body contouring procedures such as Mexico breast augmentation, abdominoplasty and liposuction.